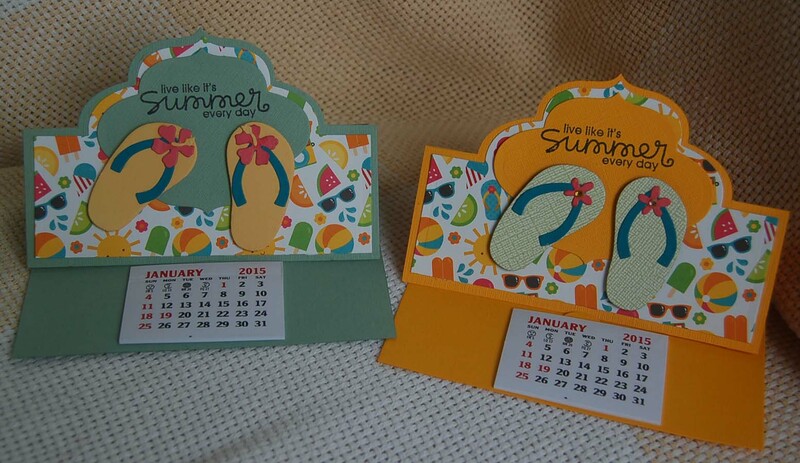 Here are my flip flop version of the calendar cards (see previous post). 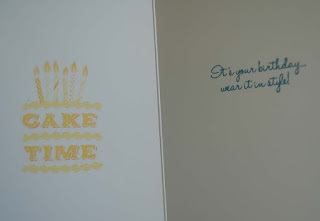 The sentiment is from the same Paper Smooches clear stamp set. Now, you would think I intend to give this to my hubby, but I actually made it for my son who always seems to be up to something dangerous that makes my mother's cautious heart do flip flops. I love the summer saying I used on my other calendar/cards so I decided to use it again because it seems so appropriate for calendars. 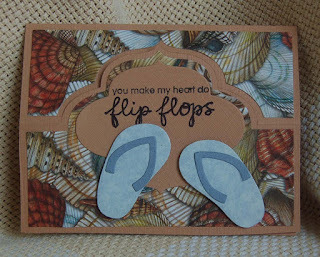 On these flip flops I added the flowers that can be made with the Paper Smooches flip flop die set. Click on the images if you want to see a close up of the flowers. The hibiscus stamen is a great detail. To the other flowers I added small sparkle adhesive crystals that I purchased in a gigantic pack from HM Ben Franklin Crafts (bargain priced!). I wish I had photographed the Paper Smooches die set before I cut apart the pieces, but at least you can see that I place the pieces in a resealable snack bag before putting them back in the PS packaging....wouldn't want to loose any of the pieces! There are lots of really great images and sayings in this PS stamp set. 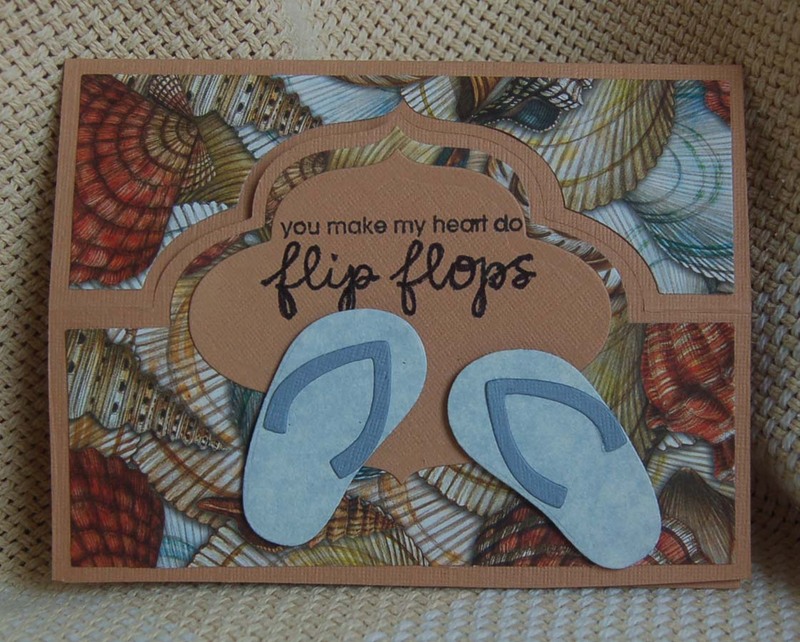 I know I'll use it over and over for my Hawaii themed paper projects. 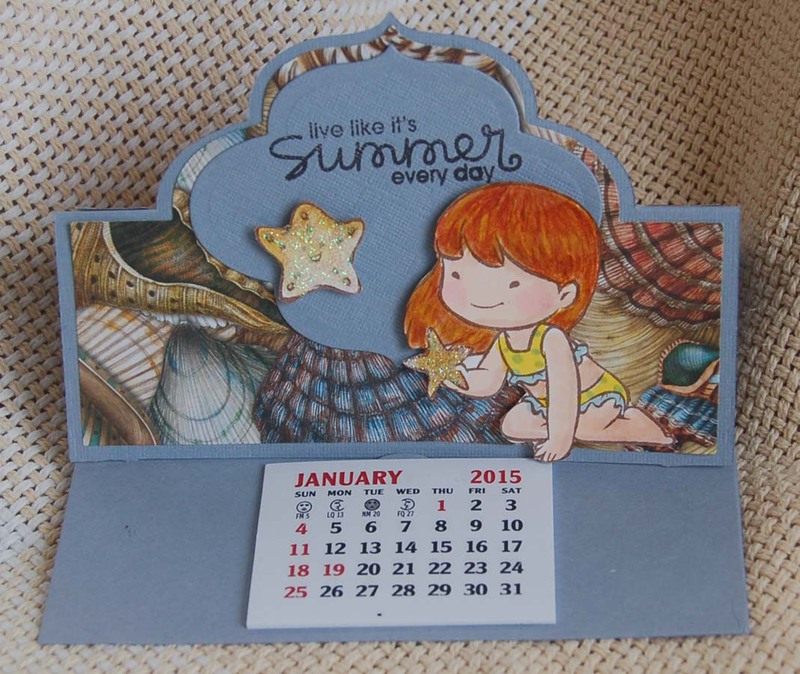 Once I get my 2016 Vippies calendars, I will start production on my cards. Hope you've enjoyed this post and will return to this site often to see what else I've created. I'd love to get some feedback comments too...if you have time to spare. 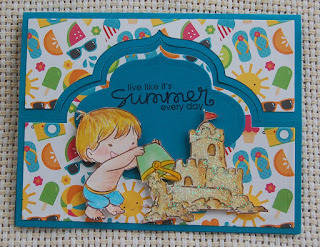 I just love this mischievous boy with the bucket of sand....reminds me of my boys. 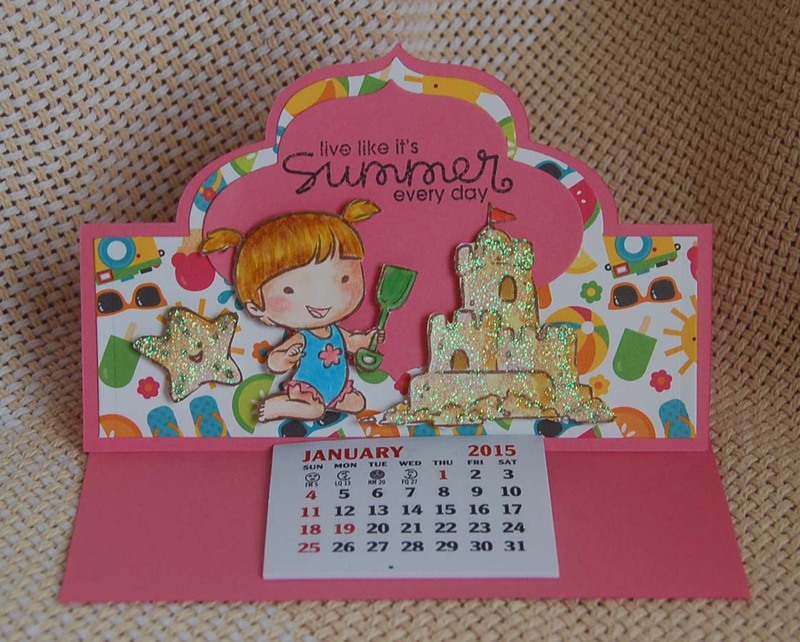 Like the calendar card in the previous post this one makes use of the Sizzix die set to cut the card base. 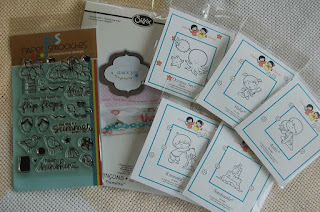 The Sister Stamp images were colored in with Copic pens and fussy cut before adhering with pop-up sticky dots. I found the colorful background paper at the Market City Ben Franklin Crafts. 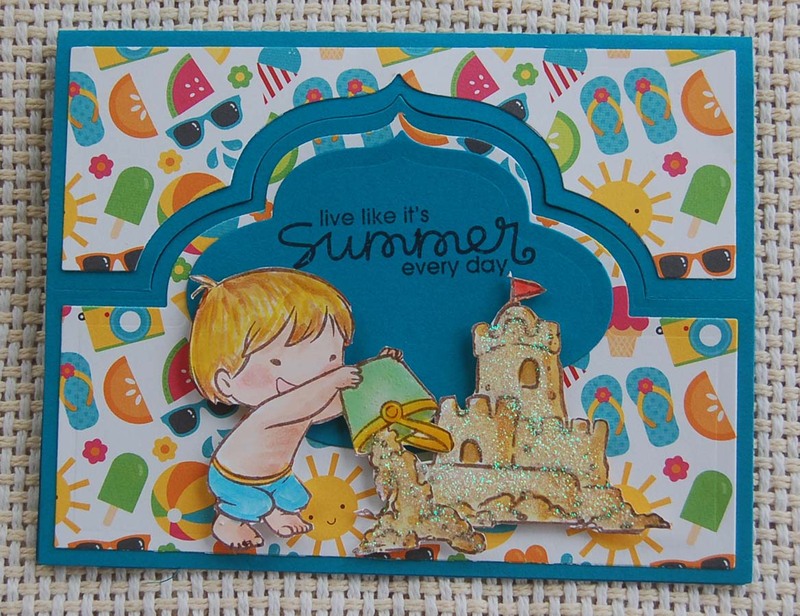 I love the sandcastle too and thought that sparkling it up with a little crystal glitter made it even more magical. 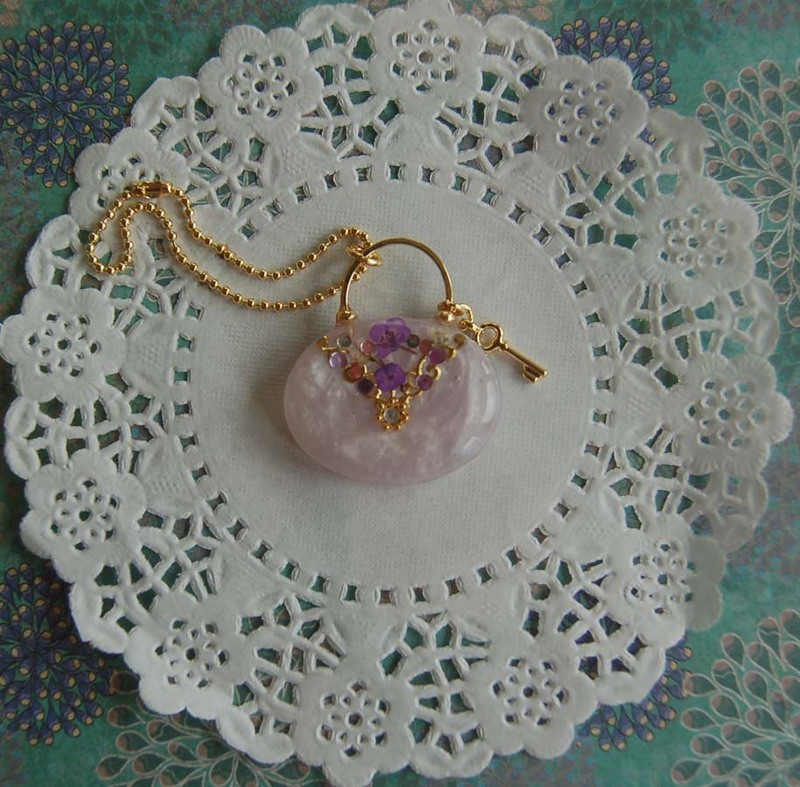 This is the girl version which I like because it's 'PINK' ! I used to have my hair like her too. LOL! Please refer to the previous post to see a photo of the supplies I used for these projects. Stay tuned for the next version of my summer calendar/card....you'll flip flop over them! 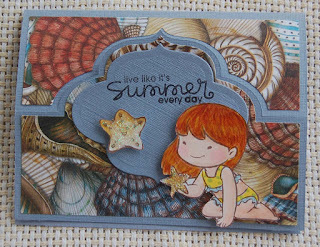 I've had these Sister Sister beach stamps all summer and I'm only now getting around to inking them up. This one of Aulii with the starfish is my favorite. 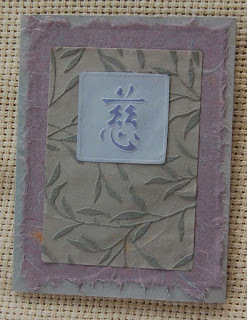 I paired it with the K and Co. shell decorative paper. For the cool pop-up card base I used a Sizzix die set that I purchased at the Hilo HM Ben Franklin Crafts (found it in the clearance bin...1/2 priced!). This wonderful set includes lots of dies that are not shown on the package front like 'take care', decorative border, and fancy shapes. 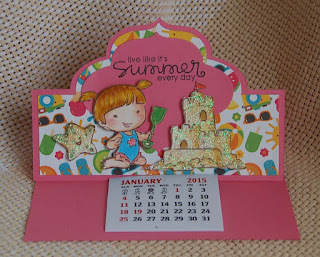 This useful die made it so easy-peasy to cut out the card and parts that I decided to turn the cards into calendars and make lots. Don't worry; I will put 2016 calendars on the ones I mail out. 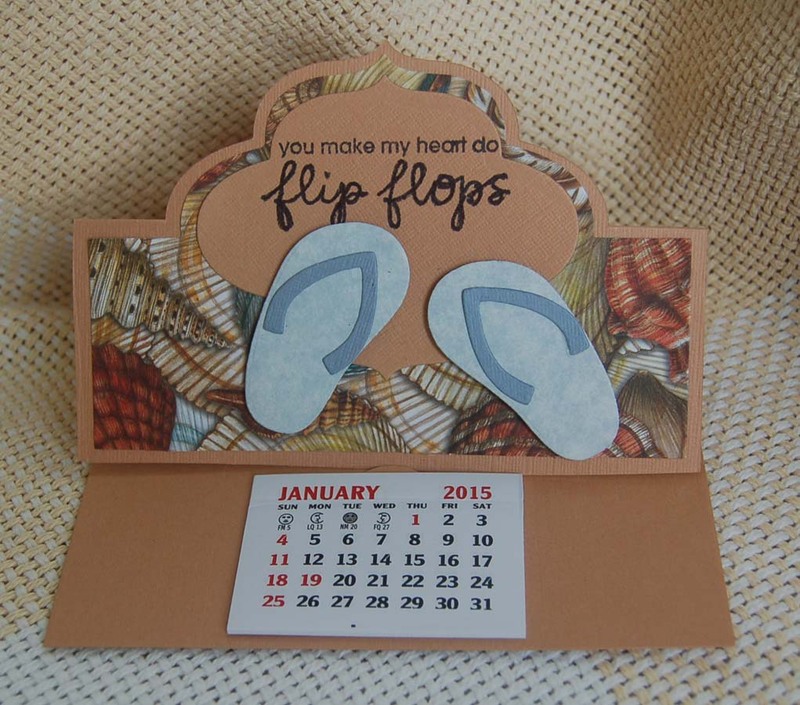 I think the saying from the Paper Smooches stamp set is perfect for a calendar coming from Hawaii. 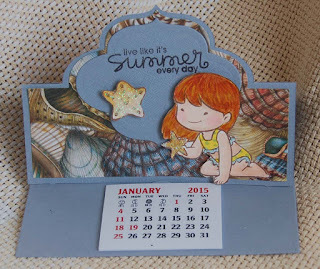 I have more styles of calendars to show in my coming posts. Please come back to see them. Happy Crafting! As usual, when I need a sympathy card, I don't have one handy. 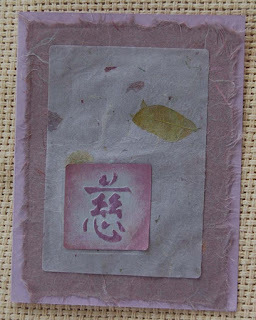 Since this one was for an Asian friend, I decided to pull out my 'sympathy' Japanese character stamp, only I didn't have one (or couldn't find it). I did have a Dreamweaver sympathy stencil which worked out for what I wanted to do. 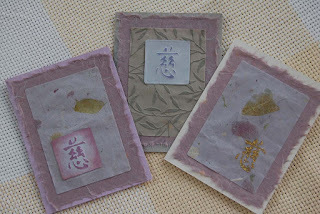 I started with a fibrous lavender washi paper torn to fit a standard card blank. Tip: To get a straight tear, hold a ruler along the line you wish to tear and run a small wet paintbrush along the line before tearing. 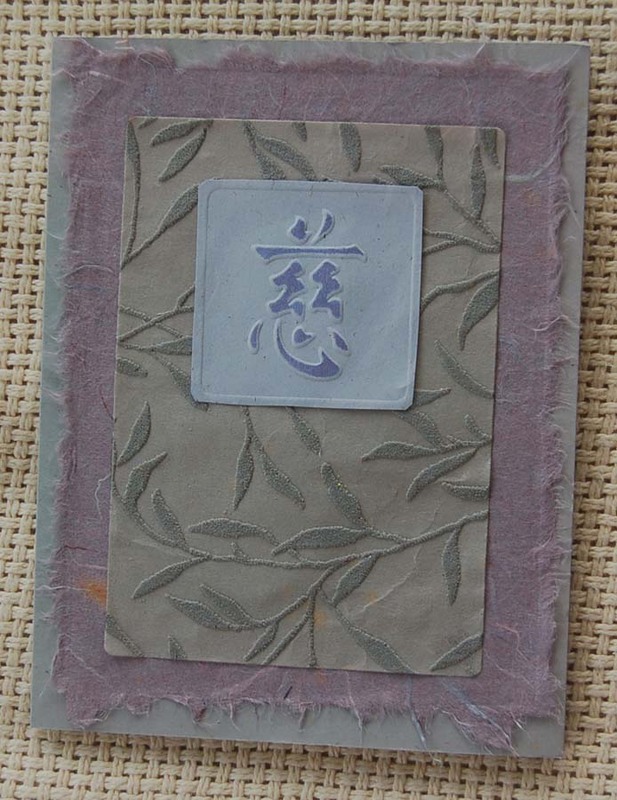 I used a Sizzix die (from a set) to cut the inner panel from a Japanese specialty paper. After taping the stencil down with a small piece of washi tape it was run through my Big Shot machine using an embossing foam pad. 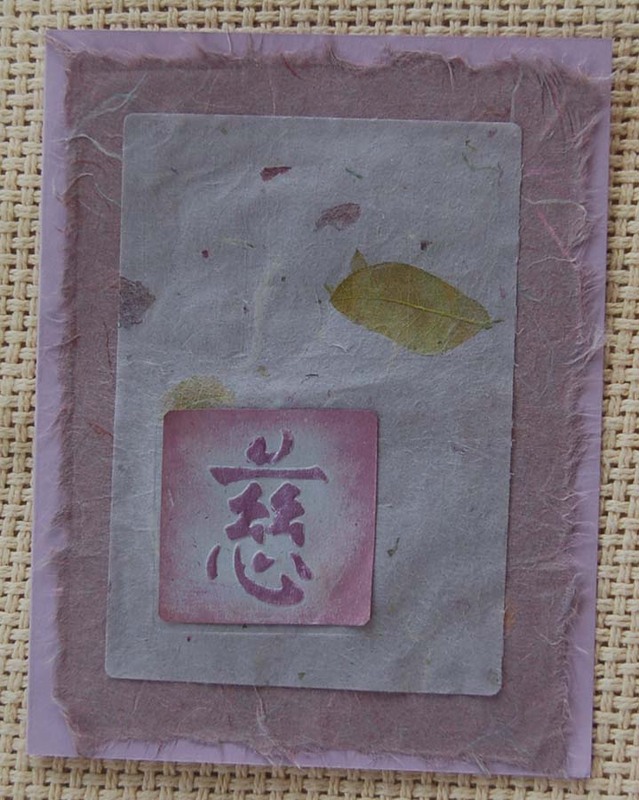 Before removing the washi tape, a little perlescent lavender ink was rubbed on the Japanese character. All the layers were mounted with Merikan double stick tearable tape (purchased at HM Ben Franklin Crafts). 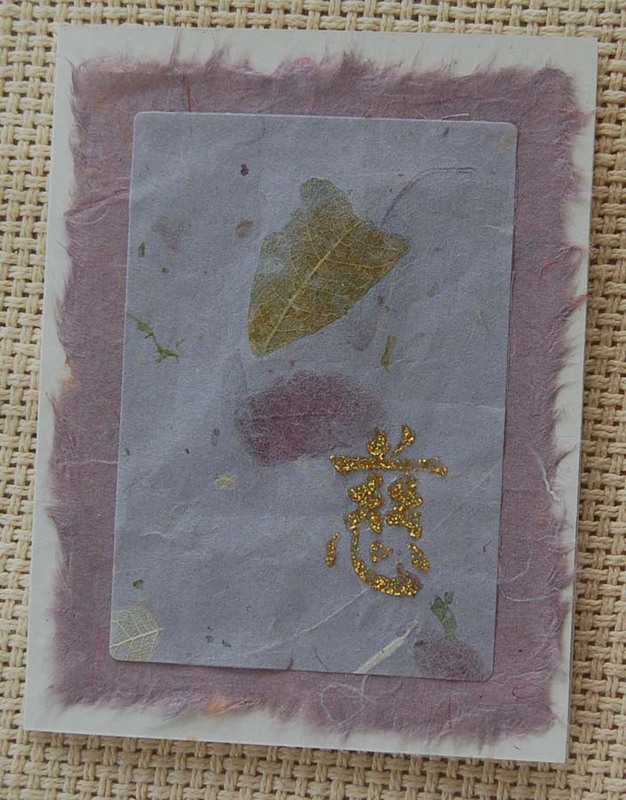 For this version, I used a specialty paper that had leaves encased in the paper fibers. 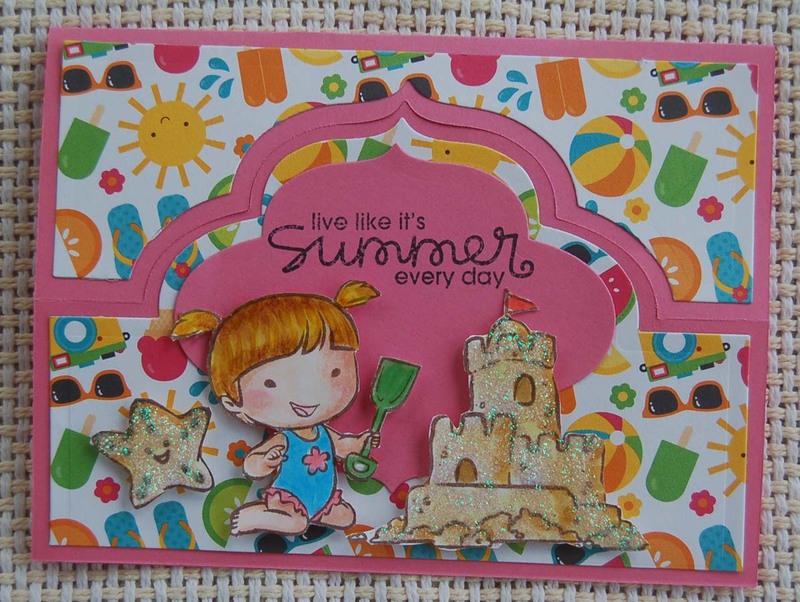 I used Bo Bunny gold glitter paste in the stencil to wet emboss the 'sympathy' character. Of the three, I think this one is the most visually pleasing. I had trouble getting the color of the stenciled character just right so I started smudging my extra 'mistakes' and made one that worked. Funny how sometimes messing around results in the best look. I was pleased with the sympathy card I created for my friend and happy to have two extra ones for my stash. Hopefully, I won't have to use them for awhile. Wishing you a splendid week of crafting! For those of you not familiar with Taj designs....where have you been?...it is a company that sells the cutest Hawaii based designed items. 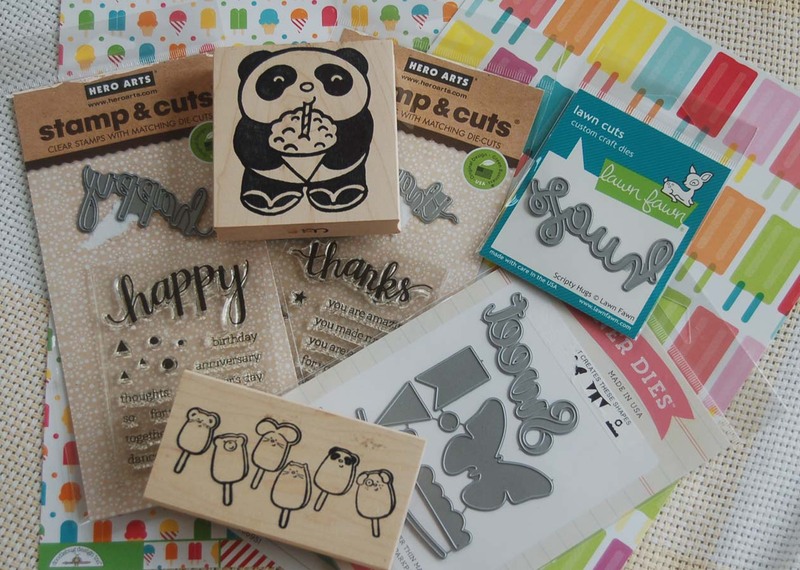 I am particularly fond of the rubber stamp designs so I was extremely pleased to find a second Taj store in Ward Center (the other store is in Ward Warehouse). 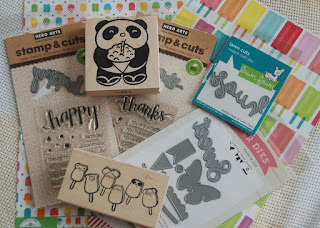 I felt like adding to my stash of tags (never know when you need another one) and thought I'd use the panda and popsicle Taj stamps. 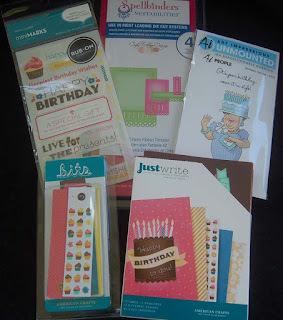 I found 12x12 double-sided card stock (Doodlebug and American Crafts) at Market City Ben Franklin Crafts which coordinated perfectly with the images. For those of you who don't like to color much, you'll find that most of the Taj designs require very little coloring skill. 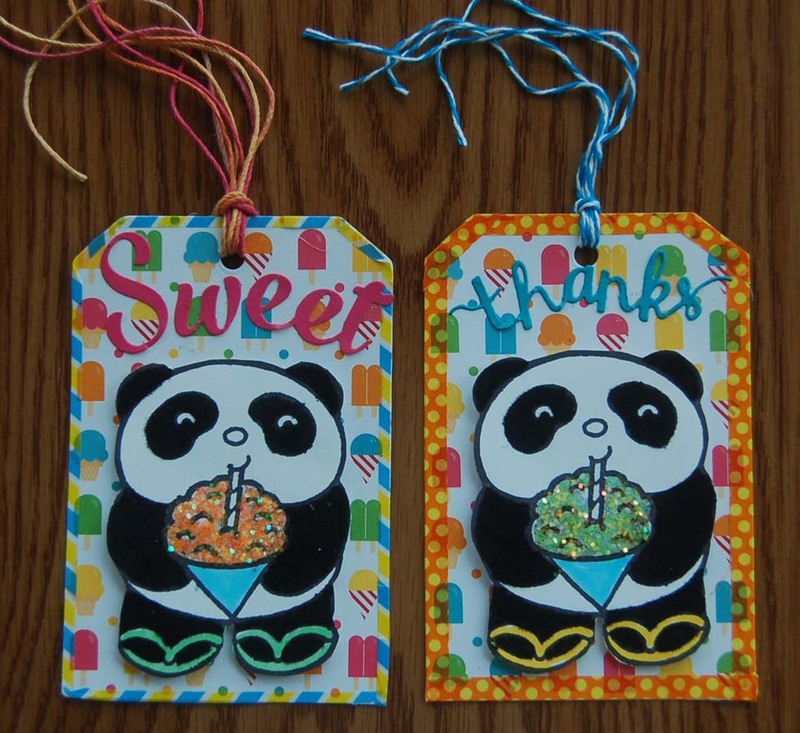 However, because the panda design had some large black areas which stamped unevenly, I added black Fun Flock (Stampendous).....instant touchable, furry bears! Large iridescent glitter (Doodlebug?) made the shave ice look 'ono'. For the edges I decided to apply skinny washi tape (from Celebrations, I think) instead of adding a second tag to frame it because I didn't want the pretty backside print to be covered up. 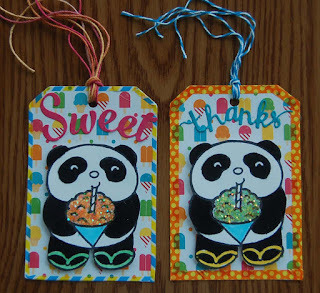 Here are two more tags which I decorated with the Taj designs. 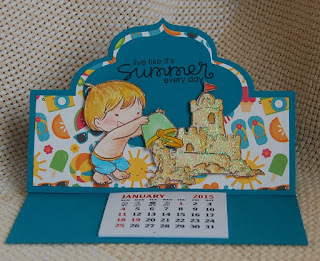 I was very excited to find the popsicle print card stock because it was perfect to use with the stamp. A little Glossy Accent was added over the Copic colored images to make the popsicles look 'lickable'. Each popsicle was adhered with 'pop' dots...hahaha! 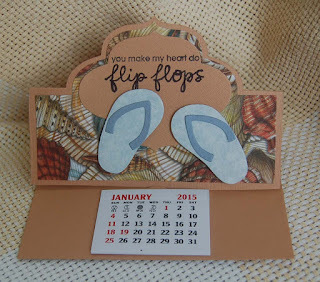 The die cut words were made with Hero Arts, Lawn Fawn and Echo Park dies. 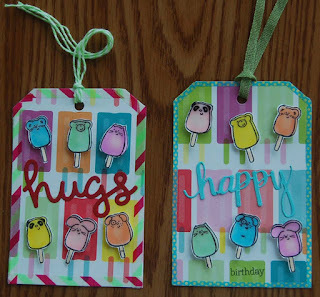 Oh, the tag was cut with a die too (Little B)...don't you just love how dies have made your crafting life so easy? There are so many beautiful and useful dies at HM Ben Franklin Crafts. Go check out the stores and start adding to your crafting fun! 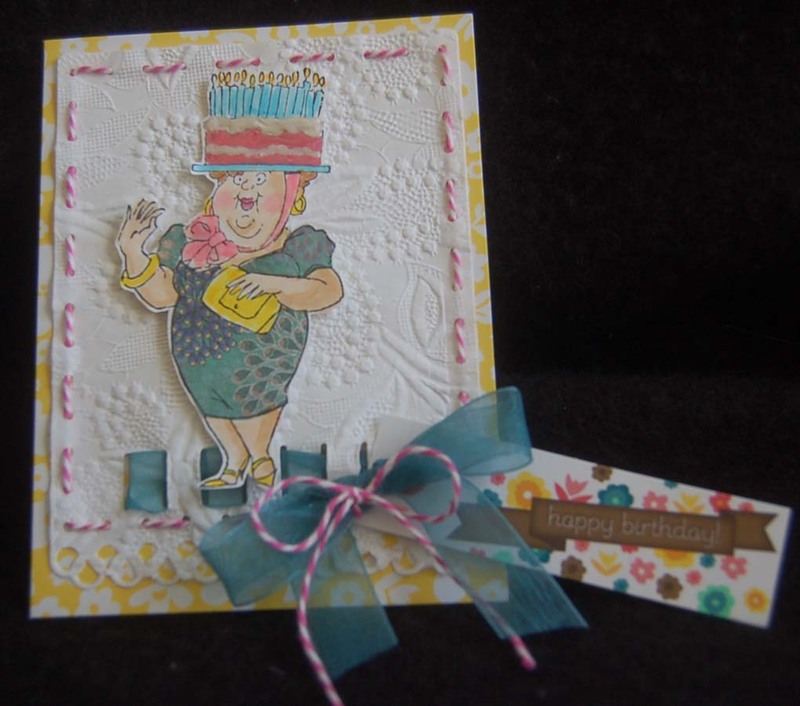 I created this card to make use of an extra fussy cut (Art Impression) image that had a paper pieced dress and to try out a new (to me) Spellbinders die that cut out the twine holes and ribbon slits. 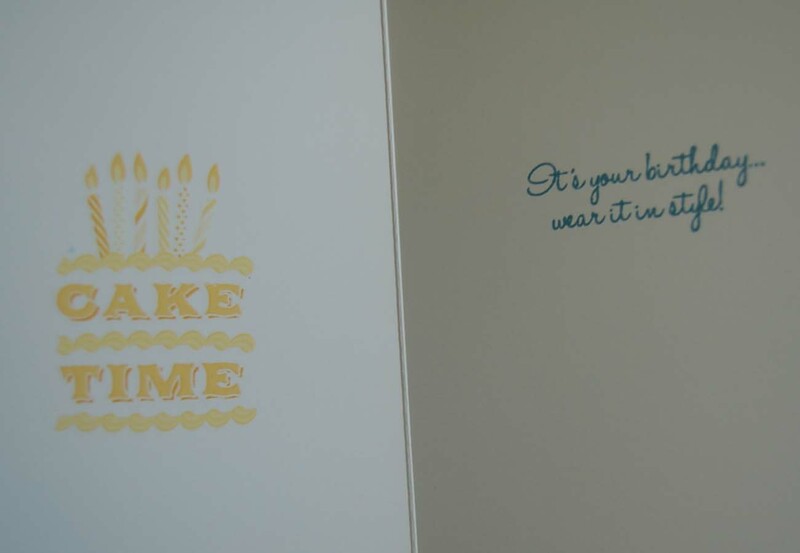 The Art Impression sentiment was stamped inside the card and an American Crafts birthday cake rub-on was added. 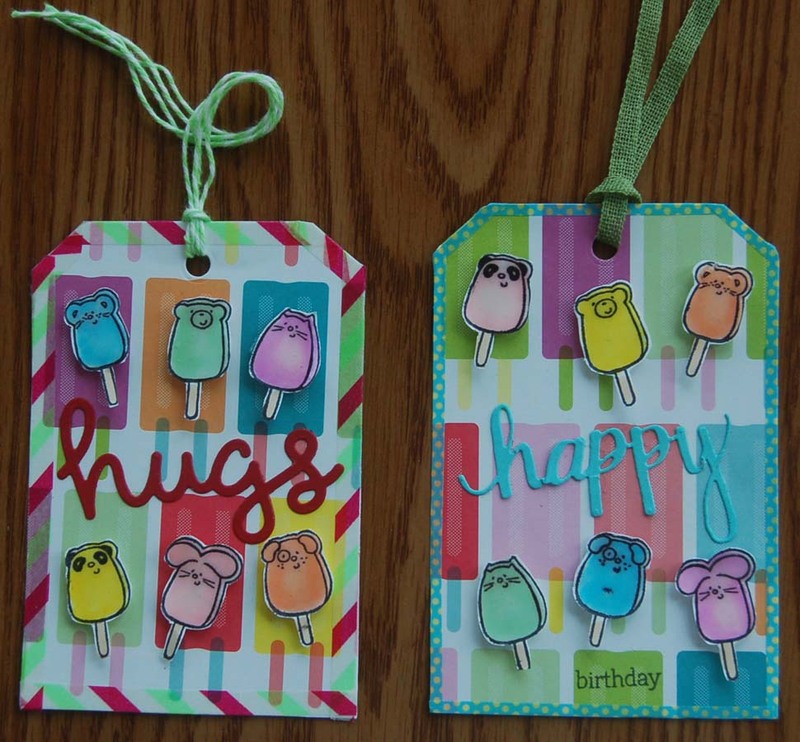 The eyelet tag is also an American Crafts product as is the yellow flowered card blank. Because of the eyelet, the tag can be swiveled so it can fit in an envelope. 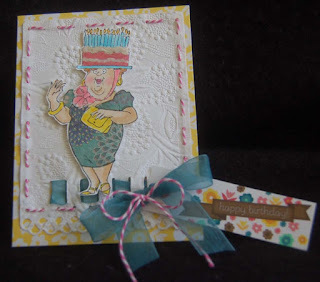 Even though I didn't have any ideas initially, this card turned out well and I am happy to have another birthday card to add to my stash. It gives me such a good feeling to be able to give a handmade card. 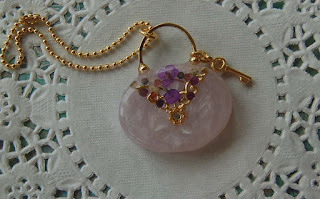 I Made It!...a Charming Resin Purse Charm from a Kit! 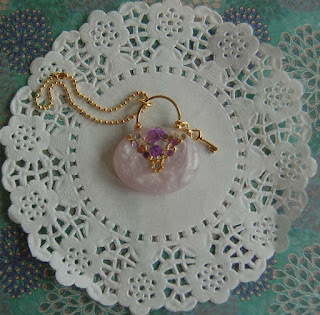 As promised, here is another project I made from the new Japan products now available at HM Mapunapuna Ben Franklin Crafts. These resin charm kits are fabulous because they contain all the parts you need to complete the project. ...even the colorants.The UV resin does not come in the kit but you will want a bottle so that you can do many of the kits. With a UV light the resin will cure within a few minutes to a hard, glossy piece. 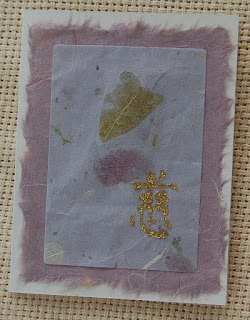 I love the gold embellishments and the dried flowers in some of the kits. My photo does not show the sparkling crystals very well but they do shine in real life. Here are a few of the beautiful kits that I couldn't resist. Oh, for the purse charms you will need a small hole drill to attach the purse handle. Perhaps the most wonderful part of these kits is that they have English instructions included...and I could follow them! 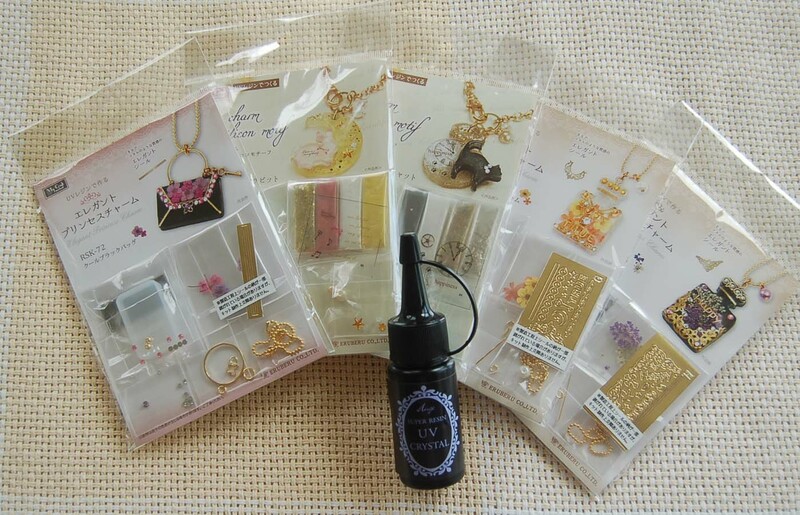 I hope that you will take a look at the new Japan products at Mapunapuna BFC. Remember Christmas is just around the corner....time to start crafting!